Marry me, love me, leave me, marry me--forget me? 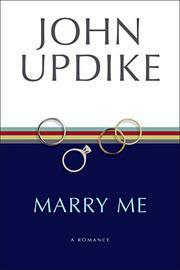 Could John Updike write an almost forgettable book? This is a temporal diversion and the fact that it is subtitled "A romance" suggests as much as it achieves. Still the Updike constants scratch up the personable surfaces--namely sexuality versus that Higher vision, "the idea of God lending a roundness of significance." It is the lack of a vaulting significance which materially and immaterially dooms the love affair between Jerry, a dimly successful cartoonist afraid of death "in the newspapers or the grass," and Sally, shiny and seductive. On the side but very much present along with their children, are Jerry's wife Ruth, steadied by her "smug" Unitarian background and her remote compusure, and Sally's churlish, offensively masculine husband Richard. In the confrontation a quatre, Richard bellows, "I'm a great horned night owl," while Jerry and Sally and Ruth waver and backpedal. Finally Sally and Jerry go off together only to find that the place is not right. "We all have a season of some kind." Theirs is over, except for revenant memories. . . . This is the gentlest book Updike has written and it is Jerry who lends it his faux-naivete--the lapsed aspirations, longer-lasting regrets. Just as appropriately it is stylistically toned down to only an occasional lyrical line--"the moon moved illumining through an ashen mackerel sky." The book's a little like a cedilla to the stronger works--a small, slow curve.